Madrid (Spain) – May 6, 2017 (travelindex.com) – By the week-ending of 12-14 May, the United Nations will have a new secretary-general heading its UN World Tourism Organisation from global tourism’s headquarters in Madrid, Spain. 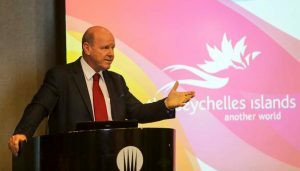 Among the front-runners is Alain Saint Ange, who resigned as Seychelles long-standing senior minister of tourism to compete for the premier post that oversees the state of tourism across the world. QUOTE: “If anything else, Alain Saint Ange’s media outreach should give him the edge as the United Nations’ new secretary-general for world tourism. The former Seychelles tourism minister has run a highly successful campaign in the global and local print and electronic media.” – Marlan Padayachee, senior journalist, travel writer, photographer, political and social commentator, private-public sector consultant and media strategist and adviser in South Africa. So far, St Ange, based on my own experience of election campaigns in the media, has run a highly successful campaign in his quest to clinch the plum post and thereby use his wealth of experience and knowledge economy to change the world of tourism towards a greater people-to-people focus and connecting the dots of an unequal tourism market, particularly in the arena of creating sustainable jobs for poorer communities, including his native Seychelles, the Vanilla Islands of the Indian Ocean Rim and Africa and the Caribbean. His media milestones to date from his campaign kick-off in January have been anything but remarkable, innovative, friendly and smart. In the media narrative, this candidate has grabbed the headlines and dominated the soundbites and the stand firsts and blurbs on radio and television. And in the run-up to the election of the new secretary-general of the United Nations World Travel Organisation, one of the leading candidates on the slate, Saint Ange, a senior ruling party politician and former government minister in his mid-ocean island nation, has received excellent and extraordinary endorsements from fellow compatriots, political personalities, tourism and hospitality pace-setters and stakeholders and influential well-wishers. Communities have also thrown their weight behind the bid to present a refreshing new face to global tourism. St Ange was the long-standing and well-heeled Minister of Tourism, Civil Aviation, Ports and Marine in Seychelles before making a dash for the top-notch UN job. Since launching his official bid in January this year, St Ange has received overwhelming support in his quest to vie for the head of secretariat of the global tourism authority. St Ange has presented the Seychelles Agenda for Tourism for All to many nations and industry players. Four months into the race and St Ange is not letting up. He is also not slowing down in his non-stop campaigning and lobbying in many capitals of the world soon after he presented his Official Nomination Documents to Taleb Rifai, current UNWTO secretary-general. He became the second official candidate on the ballot for the polling on Friday, 12 May in the Spanish cultural hotspot of Madrid. Six candidates are in the running for the highest portfolio. There is growing optimism that the new secretary-general will lead the lucrative, multi-dimensional global industry into an exciting new phase. The winning candidate will replace the outgoing secretary-general Taleb Rifai. Candidates continue to work tirelessly to pull votes from the four corners of the world to the prized high seat in international tourism. St Ange is also fighting competition in Africa, with Zimbabwe fielding a candidate backed by the African Union. South America has two candidates, Brazil and Colombia, and Georgia and South Korea are also in the race. St Ange has stayed the course and has been straddling many tourist destinations to muster support and market his progressive policies, including support for the LGBT communities who often confront violent racism, discrimination, stigmatising, stereotyping and ostracising in the tourism space and in nightclubs and social hubs. Amidst the fanfare, friendships and fraternity, St.Ange, the official Seychelles Candidate, continues to travel to woo member countries to cast their ballots for him. His latest foreign foray has been in Swiss town of Lucerne, where he engaged 500 delegates from 70 countries and marketed his “walk the talk” campaigning on sharing his new business models, inspiring personal stories and building valuable friendships. He was integral to the “Think Tank Session on Tourism” at the World Tourism Forum, the last event before the UNWTO elections. He also enjoyed the hospitality and friendship of the past president and CEO of the WTF, Martin Barth. From Lucerne, St Ange is returning to Seychelles before preparing for the final countdown to his campaign and delivering on his electoral vision in Madrid next week. Lucerne emerged as a traditional gathering of key tourism personalities, intra-networking within a strong sense of community and cultivating interpersonal relationships among CEOs, ministers, investors, academic leaders and stakeholders to create new roadmaps for generational global tourism. The electorate is crucial in the coming week: thirty-four countries are members of the UNWTO Executive Council: Angola, Azerbaijan, Bahamas, Bulgaria, China, Costa Rica, Croatia, Democratic Republic of the Congo, Ecuador, Egypt, Flanders, France, Germany, Ghana, India, Iran, Italy, Japan, Kenya, Mexico, Morocco, Mozambique, Peru, Portugal, Republic of Korea, Saudi Arabia, Serbia, Seychelles, Slovakia, South Africa, Spain, Thailand, Tunisia, and Zambia. St Ange’s election hustings carries a clear-cut message with a universally progressive policy of “Tourism for All”. He has spent hundreds of hours and resources campaigning on a platform that has blackballed discrimination in all its manifestations. There is no place for any form of discrimination in the world of tourism. He has challenged the other candidates to stand up and voice their commitment to the people-centred environment of global tourism devoid of the scourge of discriminatory practices. There will be no room at the inn for discrimination based on skin colour, race, religion, culture, creed, politics, gender, sexual preference, disability, political persuasion or wealth status. His simplified his strategy with a key campaign phrase reads: friends of all, enemies of none, equal tourism for all. The United Nations is the torchbearer of human rights and social justice and the ambassadors of its agencies will stridently promote respect, tolerance and diversity, according to St Ange. The new culture in tourism should beneficiate stakeholders, stimulate partnerships, create jobs, promote eco-tourism sustainability, resurrect cottage industries and bolster local economic developments. His campaign has attracted widespread publicity in the print and electronic media, as well as social media platforms. From interviews on BBC World to newspapers, magazines and radio stations, St Ange has articulated, voiced and aired a singular and powerful policy of connecting the dots on the world map by bringing people, cultures and destinations together to enjoy the fruits of a global village characterised by a cacophony of sounds and sights. Adopting a positive and unique approach, St Ange’s campaign has emphasised the need to reach out to the private industry and media. By far, he is the only candidate who has garnered a record number of endorsements from private companies and stakeholders in his native Indian Ocean island nation and abroad. His visibility and profiling grew progressively in the print publications, radio and television. The campaign’s coup de grace is an interview with CNN presenter Richard Quest on Quest Means Business, followed by engaging conversations with Adam Boulton on Sky TV and BBC Radio Africa. St Ange also made a raft of articles on the pages of full-colour magazines, namely Britain’s FIRST, and prestige publications in Africa and the Middle East. His interview with the Travel Daily has highlighted the impasse that tourism and insecurity are not good bedfellows and wants to make this anomaly one of the pillows in his vision for tourism, alongside pressing the UN and the UNWTO to proliferate sustainable tourism across the spectrum. St Ange has also been well received in inter-governmental forums: Thailand is among the many tourism nations that gave St Ange an audience. St Ange shared his “Tourism for All” mission and vision with Tourism and Sports Minister Kobkarn Wattanavrangkul on the side-lines of the World Tourism Travel Council summit in Bangkok. He also presented his Statement of Intent and discuss to Pongpanu Svetarundra, ministerial permanent secretary. At the meeting, St Ange was supported by his compatriots, Nico Barito, presidential special envoy to the ASEAN bloc of countries and Pascal Viroleau, CEO of the Indian Ocean Vanilla Islands, a cluster of Seychelles, Mauritius, Madagascar, Comoros, Reunion and Mayotte islands. As nations enjoying a cordial relationship, Thailand and Seychelles are committed to a pact of sustainable tourism, safety and security. The tourism agenda was also presented to the Ministry of Foreign Affairs. St Ange views tourism as good custodians of what destinations have been blessed with. He believes sustainable tourism can promote long-term tourism and help economically struggling countries to alleviate poverty and inculcate a climate of peace. Louis D’Amore, founder and president of the International Institute for Peace Through Tourism, is a great fan of this vision. For St Ange, it is worrying that major tourism giants like the USA, Britain, Australia and Singapore are not member nations. Madrid apart, the opening of satellite offices in regions and key countries is also on the cards. His manifesto will also explore other key points, such as opening cross-sectorial meetings with private sector organizations like the WTTC, PATA and others, and the UNWTO, UNESCO, ICAO, UNEP on the second side, and thirdly the importance of the media playing in local and global tourism. St Ange made his case to 12 ministers and officials at the recent African Ministers Meeting for CAF 2017 in Addis Ababa, Ethiopia. Among the high profile people were Taleb Rifai, outgoing UNWTO secretary-general, Seychellois, Elsia Grandcourt as the UNWTO’s Director for Africa and Anne Lafortune of Seychelles Tourism. A single, common passport for Southern African Development Community countries, plus a no-visa policy will contribute to boosting intra-Africa travel and business cooperation. On another front, Sinach, born Osinachi Kalu, Nigeria’s award-winning gospel singer and songwriter, also threw her support behind St Ange during a performance in Victoria recently. St Ange also identified safety and security, equality, training, and cross-sectorial interaction as being key to the future of the industry, and pledged to bring non-member states into the UNWTO, especially the USA. Alain St Ange has won the hearts and minds of the press – newspapers, magazines, radio and TV have given him good coverage and his campaign approach of engaging the private sector actively has been singled out as one of the successes of his campaign checklist. Cometh the hour, Cometh the Man: Now the hour has come and St Ange can put his best foot forward to tell the world why he should be the next secretary-general of an organisation that can reshape tourism and connect the dots of tourism hotspots and hubs from remote cultural villages to the bright lights of vibrant cosmopolitan – and it’s all about the sights and sounds of socio-cultural landmarks. Originally written by Marlan Padayachee, a senior journalist, photojournalist and media strategist in South Africa, and recipient of the British Council Fellow and the United States Information Services Award in recognition of his frontline journalism in the campaigns against apartheid and progressive reporting style in post-apartheid democracy; recipient of the Gopio International Award, New York 2015, and awarded life membership for his contribution to social cohesion and socio-political commentary of Indians and indigenous people, and recently appointed media coordinator for Africa of the New York-based Indian Diaspora Council, and continues to serve on the board of the RK Khan Hospital in Durban. Padayachee is a well-heeled traveller and tourism and travel writer who has regularly engaged Tourism Minister Alain St Ange, Seychelles Tourism and Air Seychelles people at the annual Indaba Tourism Expo in Durban and they have been in daily communication in the past six months. Marlan Padayachee is a widely published writer, editor and publisher.